It all kicked off with a family wedding in Yorkshire on Thursday. In the unexpected (but wonderful) warm weather we feasted on three courses of stomach filling stuff – think greedy servings of soufflé, rare roast beef with Yorkshire puddings and thick lemon tart – before retiring for an afternoon of champagne and sunshine followed by an evening of even more food (in the form of dainty canapés, think crispy bacon scallops, miniature meringues and everything in between. The following day thirteen of us drove down to a beautiful old house in the Derby Dales. The long weekend then unfolded in a happy blur of cooked breakfasts, hearty pub grub, takeaway to feed the five thousand and enough leftover wedding cake to feed them again. To say we’ve eaten well would be an understatement. To say we’ve eaten too much would be a fact. On arriving back in London on Sunday afternoon, despite the weekend’s overindulgence, I was excited to get back in the kitchen. Days without cooking are a luxury, but there’s always a part of me itching to return to routine, to prepare food just the way we like it, to play around with ingredients or try a new recipe. Despite having stayed just down the road from Bakewell, I never got the chance to try a local tart. With this in mind, I made a batch of sweet shortcrust pastry, popped it in the fridge to chill and ground a packet almonds in preparation to make my own version. And then I remembered a recipe I’d earmarked in Bruce Poole’s cookbook that involves both pastry and ground almonds and which I’ve been wanting to make ever since I bought the book. The poor Bakewell tart never really stood a chance. 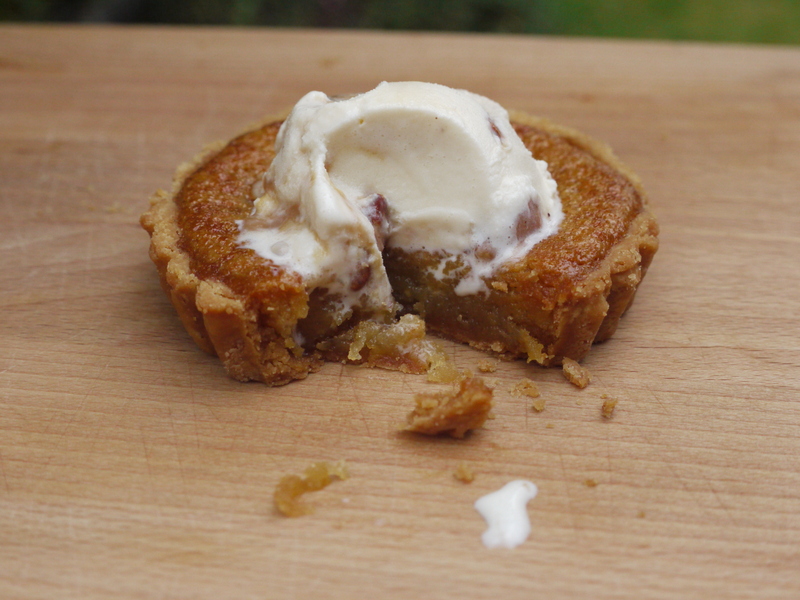 I’ve posted a recipe for treacle tart before, and even made it into ice cream, but what sets this version apart is the inclusion of ground almonds – there isn’t a breadcrumb in sight. The mixture is sticky with golden syrup and indulgently loosened with a fairly large amount double cream – an extravagant addition which is no doubt the direct result of Bruce’s restaurant roots. I’ve added a little lemon juice to cut through the richness, but the zest of an orange or a restrained sprinkling of rosemary or thyme would also work really well. 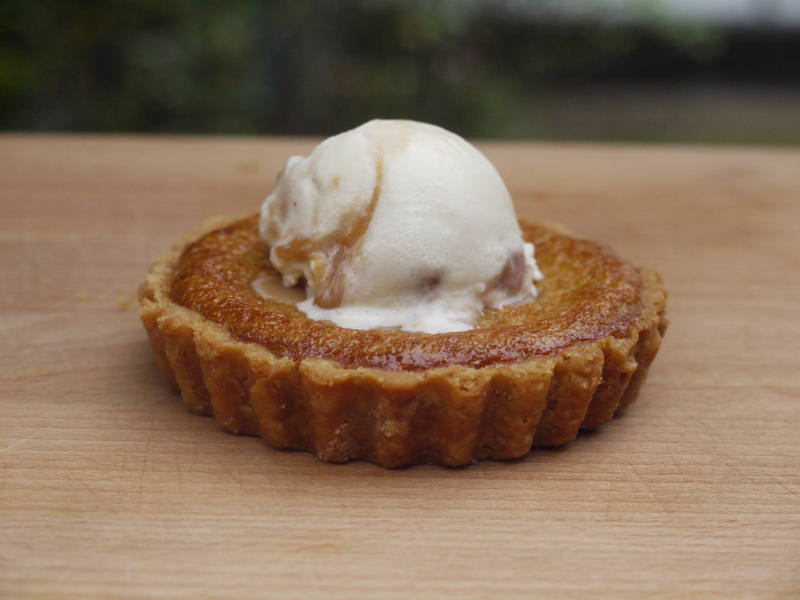 The result is a treacle tart to fall in love with. The recipe is fairly involved (I’ve cut out some of the resting stages below otherwise it could take you the best part of a day to make it!) but it’s absolutely worth it. The pastry is beautifully melt-in-the-mouth flaky thanks to copious amounts of butter and allowed to shine against a filling that is smooth and light with little of the chewy density I normally associate with treacle tart. The addition of a few flaked almonds on top adds a lovely crunch and when served warm with a scoop of cold vanilla ice cream, I can honestly think of few better flavour, taste and texture sensations. It’s not a Bakewell tart but it is utterly delicious. And you can’t say much fairer than that. For best results, you need to allow a fair amount of time for your pastry to chill – do read through all the instructions before you start to make sure your timings are right! Put the flour and sugar into a food processor and blitz. When the pastry is chilled, remove from the fridge and lightly flour a work surface. 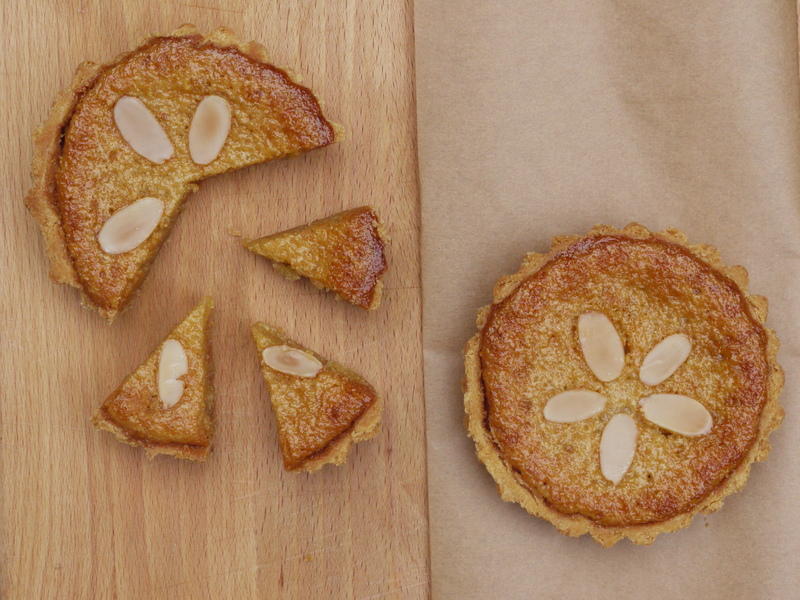 Cut into 8 – 10 equal sized pieces, depending on the size of your tart cases. Lift the pastry gently, wrapping round your rolling pin if easier, and place it over the tart case. Working fast, lift up the edges of the pastry to allow it to relax into the base of each case and press in lightly. Leave any excess pastry round the edges to allow for shrinkage. Line each case with a double layer of cling film, fill with baking beads and return to the fridge to cool for at least one hour. Preheat your oven to 220 degrees C. Remove your pastry cases from the fridge and bake on a baking tray for 10 minutes, or until the tops are golden brown. Remove the baking beans and cling film, then bake for a further 18 minutes, or until crisp and golden brown. Remove from the oven and allow to cool. Once cooled, trim the edges of the pastry so you have a neat edge. Stir together the golden syrup and ground almonds. Gently stir in the cream and lemon juice using a whisk, but stirring rather than whisking so as not to create volume. Stir in the beaten egg yolk. Pour the filling into your prepared tart cases and bake for 25 – 30 minutes. Remove from the oven and allow to cool completely before removing from the ring and serving with a large scoop of ice cream or dollop of clotted cream. Sounds like a lovely few days you had! You made me hungry with all this talk of crispy bacon scallops! These little tarts look delicious! Mmm these tarts look so good! I love your addition of ground almonds and your description is making my mouth water. Yum! After eating all that food, the last thing I would do is go back into the kitchen to cook! 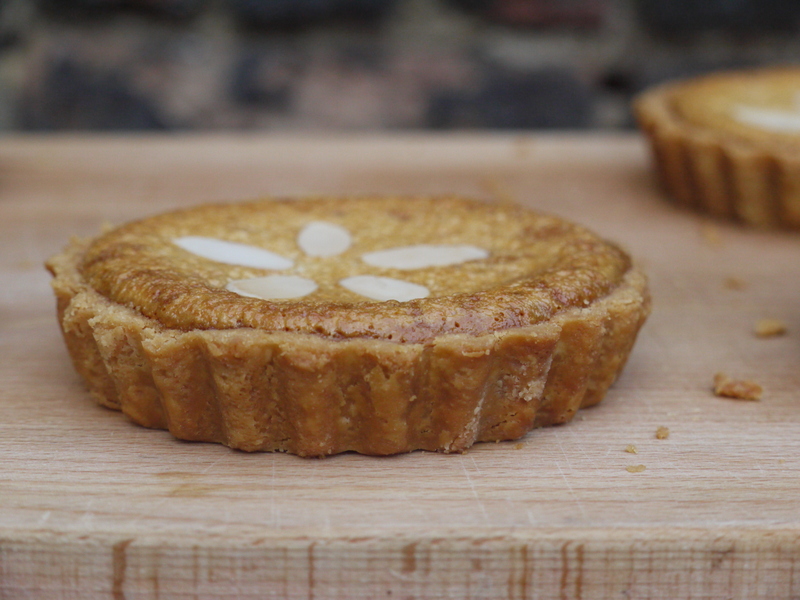 But that tart does look buttery flaky perfection. What a gorgeous little tart! Oh these look beautiful. I have to admit, I was always a little scared by the involvement of breadcrumbs in the usual treacle tart recipes. That was probably enough to make me set them aside as a British treat, not to be recreated by me! But I really really love the look of these. And I also love their size! Workinglondonmummy – I have a good opera cake recipe somewhere. I’ll have a hunt and then copy it into a comment here. Littleloaf – these look yummy! Is Bruce Poole’s book worth purchasing? I love his restaurants and he was so nice when I spent a day in his kitchen at Chez Bruce. I probably should buy it! Ground almonds sound like such a great alternative to breadcrumbs; treacle tart is one of my favourite puddings and now you’ve made it even more of a favourite! Gorgeous. Love a little tart 😉 Will have to bookmark this! My Kitchen Stories – ooh, looking forward to seeing it! Working London Mummy – thank you. I’ve never made Opera cake but there’s a recipe in Claire Clark’s book I’ve been longing to try. Or I saw Ed Kimber had done a passionfruit version on his blog which looked lovely. Sukaina – I just couldn’t resist! Amy – you should never be scared of breadcrumbs! But these are lovely if you want a slightly lighter version. Eileen – do give them a go, such a good dessert. Emma – the Bruce Poole book is fab! Very unassuming and the recipes really work. If you like his restaurant food, you’ll love it. these look absolutely stunning! 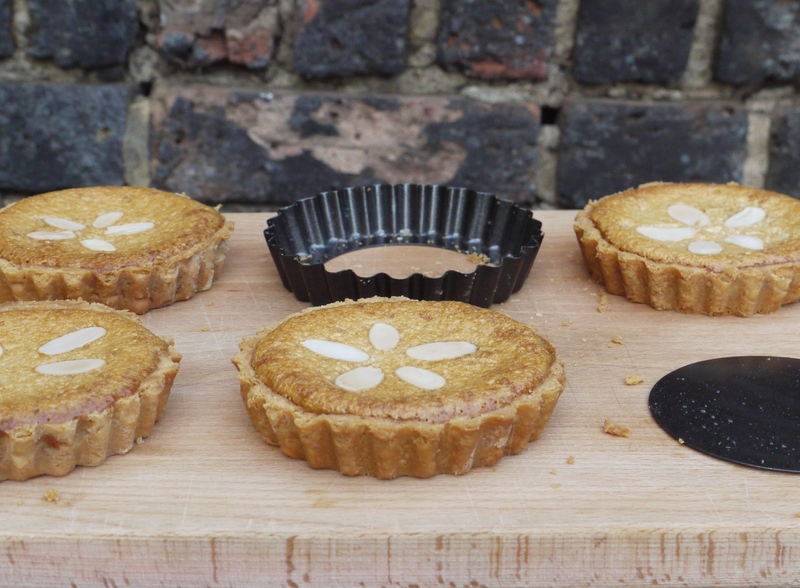 almonds in a treacle tart sounds really intriguing!